As the name suggests, this is a cookbook geared towards a contemporary audience; those who are new to the vegan game, but also, I imagine, those veteran vegans who desire a fresh take on veganism altogether. With so much information out there on the web, it can be confusing and daunting sifting through what's reliable and what's not. 'The New Vegan' is a refreshing resource that cuts to the chase and provides the reader with concise and down-to-earth knowledge on all things vegan. From juices to overnight oats to fruity granola, the breakfast meals are simply mouthwatering. 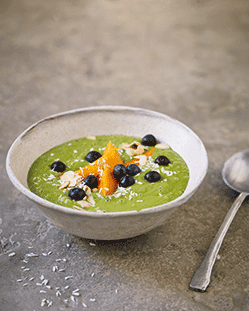 I mean, coconut, mango and spinach smoothie bowl (see image) - can you say perfection? As someone who has never made a smoothie bowl before, this particular recipe inspires me to go all out experimenting with this form. It's certainly a simple way to jazz up your breakfast routine. Skipping to the Special Meals section, I was surprised to find a jollof rice recipe. 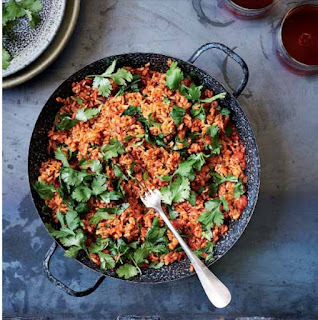 Yes, our beloved jollof rice (image below). Knowing how sensitive my fellow West Africans are when it comes to this dish (did you follow Jamie Oliver's #jollofgate scandal back in 2014? lol), I approved of the author's decision to offer a disclaimer: "Of course, this is very much my own (anglicised) spin on things so if you're looking for an authentic version of what I now realise to be a staple national dish for much of West Africa, this probably isn't it." To be honest, the recipe looks just as delicious as it's supposed to look, so I am excited to give this version a try. I imagine that the addition of paprika will give it a lovely, smoky flavour, and I am here for that! On the sweet side of things, I was drawn to the strawberry galette, which is so unbelievably quick and easy to prepare, but would make a wonderful centre piece at any dinner party. Special shout out to the banoffee pie recipe too which is raw, decadent and one of my personal favourite vegan desserts. Finally, the cruelty-free beauty recipes are good enough to eat. Think body scrubs made with banana, body moisturisers made with whipped coconut oil, and exfoliator made with avocado & oatmeal. Like I said, good enough to eat! 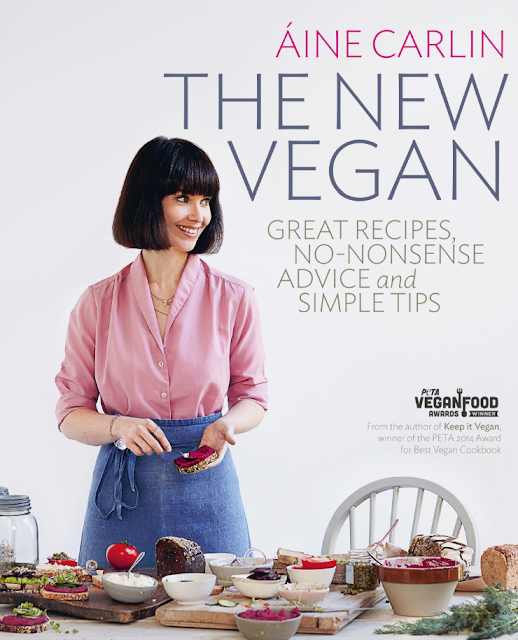 If you're an avid cookbook collector like myself, the 'The New Vegan' is a worthy addition to your shelf, and would also make a useful and stylish gift to someone you know who's starting out or thinking of starting out on this lifestyle. It is accessible and appealing, showing just how easy it is to be vegan in this day and age. The cookbook is available on Amazon and more info can be found on the publisher's website: www.kylebooks.com. Note: This review has been organised by the VEGAN Lifestyle ASSOCIATION. It has not been paid for and the copy of the book I received was sent free of charge. This is my genuine and unbiased review of the book.